1 The Russian language is recognised as a language of state and other institutions (art. 6 of the Constitution) and is widely used. 2 Annulled by Georgia immediately thereafter. 3 Establishing retro-actively de jure independence since the 1992–1993 war. 4 By Russia. Followed by 5 other UN states since. 5 De facto currency, several Abkhazian apsar commemorative coins have been issued. The apsar is on a fixed exchange rate, pegged to the Russian ruble (1 = 0.10 apsar). ↑ Site programming: Denis Merkushev. "Акт о государственной независимости Республики Абхазия". Abkhaziagov.org. Retrieved 22 June 2010. ↑ "Апсныпресс – государственное информационное агенство Республики Абхазия". Apsnypress.info. Archived from the original on 28 May 2010. Retrieved 22 June 2010. ↑ "Abkhazia: Review of Events for the Year 1996". UNPO. 31 January 1997. Archived from the original on 5 June 2010. Retrieved 22 June 2010. 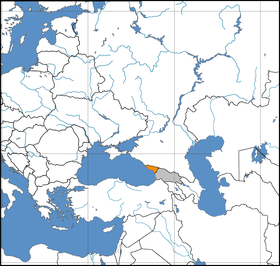 ↑ "Abkhazia calculated GDP – News". GeorgiaTimes.info. 7 July 2010. Retrieved 22 September 2011. ↑ "Abkhazia remains available by Georgian phone codes". Today.Az. 6 January 2010. Retrieved 20 January 2010.